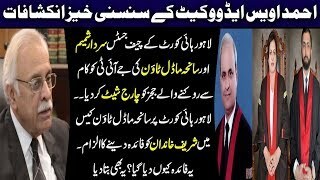 This is a clip which the Chief Justice and the Prime Minister must watch, and the Chief Justice MUST take suo moto notice in this case and call MR Ahmad Awais for a hearing. The nexus between those who bled Pakistan white and certain Judges of the Lahore High Court has become an open challenge to the state. This will certainly lead to instability in the country, and because the army may have to be called in to restore order, Gen Bajwa should also watch it. The evolving threat from this unholy alliance between certain venal judges and the arch criminals of Pakistan must be met and ruthlessly crushed before it assumes a far more dangerous form. Prime Minister Nawaz Sharif appears to be caught in a political nutcracker, mostly of his own making. On May 11, it was Imran Khan who stood, amidst thunderous applause, at Islamabad’s D-chowk demanding: electoral reforms, thumbprint verifications in four constituencies, as well as investigations into election rigging. And then there was an ingenious Dr Tahirul Qadri, who offered an impressive fusion of Islam, constitutionalism and technology. The fiery cleric held large crowds spellbound with his rejection of the current parliamentary system. For his part, PM Nawaz needs to find a political solution — and he needs to find it fast. The heads of both the PTI and PAT are capitalising on the political space created by his unending brinksmanship with the military that skyrocketed following allegations that PM Nawaz Sharif had aligned himself with a private media group against GHQ – a situation that has also left PML-N friendless in an increasingly hostile media market. There is also little doubt that both PTI and PAT agendas have gained a sharp edge from the recent turn of events. But these agendas present an interesting challenge, not only to PM Nawaz but also to the whole political set-up, of which PTI is also part. Clearly, PML-N decision makers fear that acceptance of thumbprint verifications risks undermining the legitimacy of the party’s impressive victory in the 2013 elections. Though mainstream media tends to focus on Imran Khan and his demands (viewing Qadri’s agenda as unrealistic and unachievable), more and more young men and women have started to find Dr Qadri more logical, clearheaded and nuanced than Imran. Is there a political significance? Yes, it means if Imran is seen becoming soft on Nawaz, or fails to achieve any concessions then the dissatisfied ranks of the opposition will find Dr Qadri the more attractive candidate of the two. Given that his relations with the military establishment are not all that good, it is imperative for Nawaz to strike a compromise somewhere. What remains to be seen is: will he accept Imran’s political demands to reform the electoral system or will he quietly settle his differences with the restive military establishment? In an appearance on Express TV after the May 11 jalsas, Punjab’s Law Minister Rana Sanaullah, renewed Railway Minister Khawaja Saad Rafique’s earlier offer in the National Assembly that PML-N will be willing to accept thumb print verifications if PTI also agrees to allow the same exercise in four constituencies of PML-N’s choice (NA-55, 56 in Rawalpindi from where Sheikh Rashid and Imran Khan won and NA-149 and NA-150 in Multan from where Javaid Hashmi and Shah Mehmood Qureshi won). Rana argued that ever since this counter-offer PTI has been quiet. However, towards the end of the same broadcast, senior PTI leader Asad Umar said that his party had accepted in lower house PML-N’s demand for counter verifications in four PTI constituencies. Asad said that in response to this Khawaja Saad Rafique then proposed, rather strangely, to make a parliamentary committee to examine the issues which looks to PTI like “backing off” from the initial proposal since both parties need to go straight to the Election Commission for fact-finding instead of wasting time with a fact-finding parliamentary committee that won’t have the capacity to determine facts. Now it seems PML-N had calculated that their counter-proposal of doing thumbprint verifications in four PTI won constituencies will unnerve the PTI but apparently PTI has called their bluff and now PML-N is trying to wriggle out of the deal. But political arguments are like peeling onions, so it remains to be seen how the PML-N will now respond to this latest clarification by PTI. But now ongoing negotiations assume a new meaning given Imran Khan’s carefully worded but firm demand from the current Chief Justice that the Supreme Court needs to order thumbprint verifications in the four constituencies. This time around the court will find it difficult to ignore the case. Irrespective of what the court may or may not do, the emerging scenario demands that PM Nawaz Sharif show flexibility and compromise with the parliamentary opposition or the military establishment. He may also need to reflect on the PML-N’s media management; perhaps initiating a move to diversify his media support instead of relying exclusively on one media group.